This project is a collaboration with R.W. Boyd and S.H. Chen on the efficient and robust cholesteric laser [1,2]. We plan to create miniature, low threshold, polarized light sources using electroluminescent, doped liquid-crystal polymers with chiral microcavities: microlasers and light emitting diodes for medicine, telecommunications and ultrabright displays as well as electroluminescent single photon sources for quantum communication. K. Dolgaleva and Simon K. Wei carried out the experiments. Figure below shows cross-sections of two cholesteric laser beams on the screen. The idea of lasing in cholesteric liquid crystal (CLC) was first proposed by Goldberg and Schnur in 1973 . Independently Kukhtarev proposed the idea and developed a theory of CLC distributed feedback lasers in 1978 . First experimental observation of lasing action in CLCs and a number of follow-up experiments were performed by Il'chishin et al. [5-7] in 1980, almost twenty years before the nature of lasing in CLCs at the photonic band-edge was explained by Kopp et al. . Taheri et al. reported the observation of laser action in CLC structures shortly after Kopp et al. . CLC lasers became a subject of great interest over the past decade. They combine tunability of dye lasers together with compactness and robustness of semiconductor lasers. See the Chiral and Other Photonic Crystals page for more details about planar aligned 1-D photonic bandgap cholesteric structures and their preparation. We proposed a new highly efficient organic dye, oligofluorene, which has great potential for lasing in cholesteric monomeric and glassy liquid crystal oligomers. We performed a detailed comparative experimental study of the laser characteristics of cholesteric monomeric liquid crystals doped with oligofluorene and a well studied dye, DCM, commonly used for lasing in CLCs. Oligofluorene-doped CLCs yield a total output energy in transverse single-mode regime five times that of DCM-doped CLCs with superior temporal and spatial stability . Glassy and fluid CLC structures were evaluated for laser performance with an oligofluorene dopant. With picosecond excitation the output from a glassy CLC laser was temporally stable, but that from a fluid CLC laser decayed with time due to external perturbation of the supramolecular structure. . 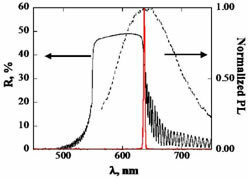 Figure shows selective transmission spectrum of glassy CLC, photoluminescence spectrum of oligofluorene dye in a nematic film and lasing emission in a glassy CLC structure. L.S. Goldberg and J.M. Schnur, "Tunable internal-feedback liquid crystal-dye laser", US Patent, 3,771,065 (1973). N.V. Kukhtarev, "Cholesteric liquid crystal laser with distributed feedback", Sov. J. Quantum Electron., Vol. 8, 774-776 (1978). I.P. Il'chishin, E.A. Tikhonov, V.G. Tishchenko and M.T. Shpak, "Generation of a tunable radiation by impurity cholesteric liquid crystals", JETP Lett., Vol. 32, 24-27 (1980). I.P. Il'chishin, A.G. Kleopov, E.A. Tikhonov, and M.T. Shpak, "Stimulated tunable radiation in an impurity cholesteric liquid crystal", Bull. Acad. Sci. USSR, Phys. Ser., Vol. 45, 1376-1383 (1981). I.P. Il'chishin, "Optimizing energy output and angular divergence of a DFB laser with cholesteric liquid crystal", Bull. Russian Acad. Sci. Phys., Vol. 60, 494-498 (1996). V.I. Kopp, B. Fan, H.K.M. Vithana, and A.Z. Genak, "Low-threshold lasing at the edge of a photonic stop band in cholesteric liquid crystals", Opt. Lett., Vol. 23, 1707-1709 (1998). B. Taheri, P. Palffy-Muhoray, and H. Kabir, ALCOM Symposium, Chiral Materials and Applications, Cayahoga Falls, Feb. 18-19 (1999). S.G. Lukishova, L.J. Bissell, J. Winkler, C.R. Stroud, "Resonance in quantum dot fluorescence in a photonic bandgap liquid crystal host", Optics Letters, Vol. 37 (7), 1259-1261 (2012).